St Mary's Bourne Street is an Anglican church near Sloane Square in London. It was built 'quickly and cheaply' in 1874, with the intention of providing ministry to the poor living in the nearby slums of Pimlico. In London during the 19th century, there was rapid development of Belgravia and Pimlico which was accompanied by the building of many new churches in the area. In addition, the construction of the London Underground resulted in many houses being demolished by the 'cut and cover' works. In 1874, St Mary's was built directly over the path of the District line in the Early English style using cheap machine-made red brick. The church was designed by R. J. Withers, a little known architect practising predominantly in the West Country. Withers had previously undertaken alterations to churches in London, and was working at St Paul's Church, Knightsbridge, when the decision to build St Mary's was taken. With his reputation, according to his obiturist, of building ‘a good cheap type of brick church’, he was the obvious choice to design St Mary's, which was originally intended to act as a servant's church. Other architectural features resulting from the economic construction include low windowless aisles and plain slate roof with a bell cote housing a solitary bell. Buttressing was added by Harry Stuart Goodhart-Rendel following bomb damage in World War II. "A spacious nave is terminated in an apsidal chancel and there are two aisles. The nave is very lofty and the interior of the roof is elaborately decorated with colour. 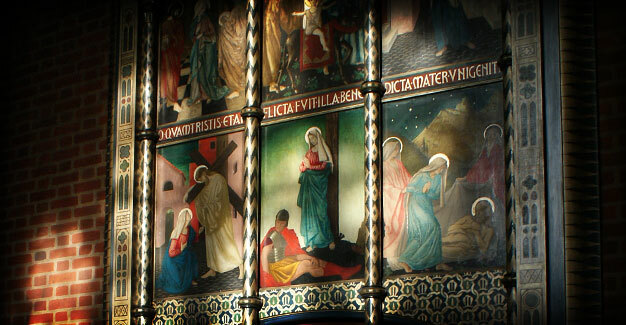 Bold figures of Our Lady and St John on either side of a crucifix appear on the reredos, in front of which stands one of the most effective altars we have seen of late. It is formed of sweet cedar, and is richly ornamental with gold and colour. The chapel as a whole is remarkably effective, and has a solid and substantial look which is highly satisfactory. 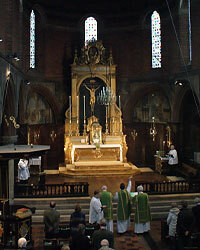 It is, in a word, an excellent specimen of an inexpensive church, the cost of the whole, not counting special gifts such as the reredos, altar, font etc., being about £4,500.". The liturgy and worship at St Mary's combines Gregorian chant, Renaissance, Viennese and contemporary sacred music with the majestic language of the Book of Common Prayer. The ceremonial is rich and traditional. The church has been beautified by successive generations and remains strangely simple and peaceful…despite the gentle rumble of the trains underneath.